The chances are that you’ve heard about UV rays. These are invisible sun rays that are emitted by the sun and are hard to block, but what you might not know is just how harmful these rays can be. UV damage can cause all kinds of problems like skin damage, excessive tanning, erythema, eye damage, increased skin aging, and even skin cancer in some cases. This is why it’s so important to have proper protection against harmful UV rays. When it comes to skin protection, everyone takes care to protect themselves from UV rays. We use sunblock and sunscreen to completely mitigate UV damage. However, when it comes to our eyes, most of us completely gloss over how UV rays can affect us. The truth is that our eyes can be severely damaged by UV rays and produce harmful side effects. This can cause anything from temporary eyesight loss and cataracts to macular degeneration, pterygium, and photokeratitis. This results in a disastrous situation for us where we’re faced with possibly losing our vision entirely. Thankfully, there is a solution if you want to protect your eyes. UV sunglasses provide a viable solution for shielding your eyes from high levels of UV radiation. This way, you can stay in the sun all day long without any side effects. 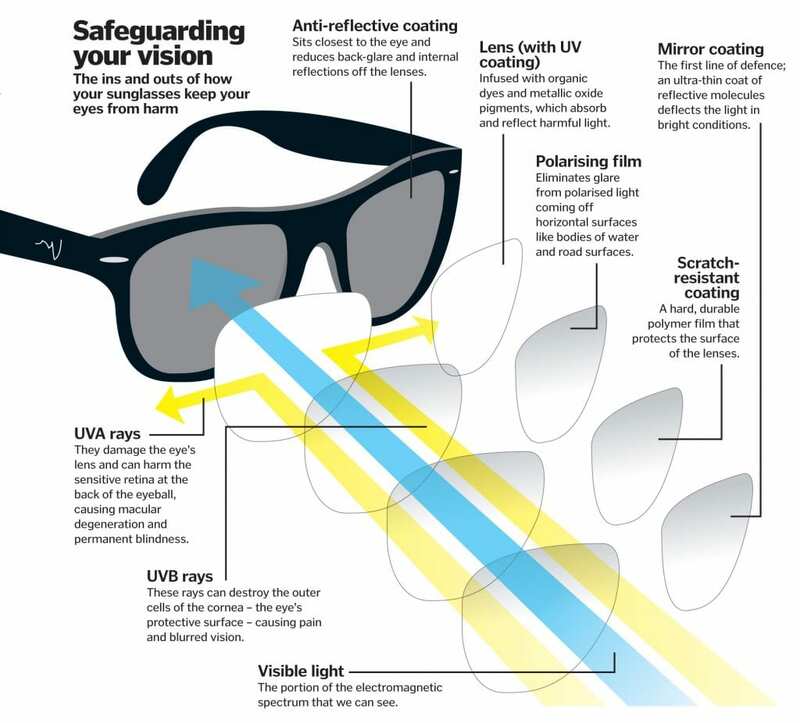 How Does UV Protection Work? The sun constantly emits UV rays along with sunlight and heat. UV radiation is invisible to the naked eye and can only be seen by special equipment. UV light is typically broken down into three classifications: UVA, UVB, and UVC. Only UVA and UVB rays actually reach the Earth’s surface because the atmosphere absorbs and dissipates UVC rays completely. UVA rays can pass through materials like glass easily, but it hasn’t been proven conclusively that they cause any eye damage. UVB rays, on the other hand, are extremely dangerous to the eyes and have been proven to cause permanent damage. 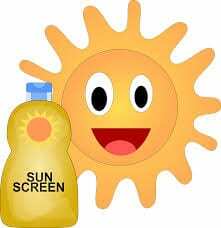 The good thing is that you can defend against UVB rays using basic protection like glasses and sunblock. Special glasses like UV protection glasses can serve to provide active protection from any harmful UV damage. These glasses come with specialized coatings that can block UV rays, dissipate them, or reflect them entirely. Believe it or not, there’s more than one kind of UV protection you can opt for in your sunglasses. Blue blockers are quite common types of UV protection sunglasses. You can usually find them with amber-colored sunglasses. True to their name, blue blockers are meant to block harmful blue light that can enter and damage your eyes. These types of glasses are more suitable for people like fishers, skiers, and pilots. Polarized glasses are sometimes coupled with UV protection. As a result, they offer increased underwater visibility, reduced glare, and UV protection. This makes them perfect for fishing, boating, skiing, and any other kind of snow or water sports. Gradient glasses are UV glasses that are tinted mostly at the top and get lighter as you go down the lens. This makes it great for avoiding overhead light while making sure the rest of the lens isn’t too dark. This makes it great for driving because it doesn’t take away too much visibility. Mirror-coated glasses have a highly polished mirror-like coating on the outside of the lens. This makes it so most of the light is reflected away before it even hits your eyes. This greatly reduces considerable amounts of damaging light. These glasses are ideal for those who have a high sensitivity to light. They are also used by people who indulge in snow sports that have a chance of high light reflection. Photochromic glasses are UV glasses that have a special UV coating on them. This coating actively reacts to UV and will darken based on the intensity of the UV light. This is a great option if you want active UV protection without having glasses that are dark all the time. Which UV Glasses Provide the Best Protection? It’s hard to narrow down which glasses are ultimately better. There’s no universal winner here. The types of glasses detailed above will provide adequate UV protection. On the subject of which is the best, it’s entirely up to you. Some glasses will be suitable for some situations, while others will favor other uses. It all depends on what you want to do and what kind of protection you’re looking for. However, for most cases, a decent pair of blue blockers or mirror-coated glasses will serve you well.